What happens to the physical location of a comic shop when the store itself closes? Patty Wetli follows up on the October closing of Variety Comics. Either Jarkata is still trying to overcome a stigma of comics as being a lesser medium, or Adil Akbar is, like some of his American counterparts, woefully behind the times. In either case, at least he didn't use the stereotypical "Bif! Pow! Wham!" headline in his argument that comics are literature. Finally, I don't have any real news to go with this picture, but I just really liked it. 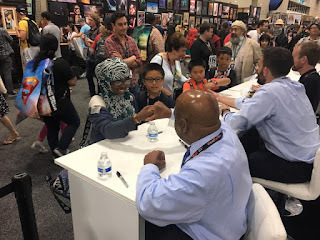 It's Congressman John Lewis talking to a young fan at Comic Con, not long after he won an Eisner Award for March. Taken from Top Shelf's Facebook page.